My husband works 3 or 4 nights a week so on those nights, bedtime routine is all me. Within roughly a 30 minute period I put all three kids (3 years, 2 year, 1 year) in their beds for some zzz’s. Some nights I think I will rip my hair out or just make myself faint and pray I wake up to children who’ve fallen asleep in their own beds after an angel brushed their teeth. 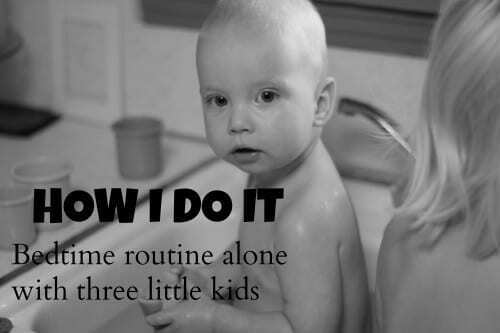 Alas… but 90% of the time I have the routine down pat and all get tucked in with very minimal fuss. Oh and, note to the single parents out there, I won’t even try to say I know how you feel because, honestly, part of what gets me through the many parenting hours alone is knowing that some nights I am not alone. You are really doing an amazing job out there. While reading individually to children is very important, it’s just not something I’ve found success with at bedtime when I’m on my own. I generally read to all the kids at once on the couch from 6:30pm onwards. I try to keep them seated on the couch or the floor in front of me and direct them back if they begin to get rambunctious. I find it settles them. I rotate books between the various levels, board books to easy reads to Fancy Nancy. I attempt to get everyone into bed between 7-7:30pm most nights. I begin the process a few minutes before 7 and everyone is generally tucked in tight by 7:30pm. I’ve found that altering this time by even 20 minutes can result in contagious meltdowns. And let me tell you, that’s something I try actively to avoid when I’m on duty alone. I’ve found it’s easier to put Prince (1-year-old) to bed first because the older kids are able to sit relatively still during this part. I give Prince a little snack around this time and some milk. I then change diaper, put on pajamas, and kiss and cuddle until I’ve had my fill. I pray over him and then go upstairs with the older kids. While I’m putting Prince to bed I ask the other two kids to wait on the bottom of the stairs (or go upstairs if they wish) for me. I like to ask them to sit at the bottom of the stairs so they are away from Prince and don’t get him excited, and so they have something to “do.” Even sitting gives them some kind of goal and prevents them from finding or playing some super exciting (too too exciting) game right before bed. When I’ve got Prince in bed, we all go upstairs. I then get everyone dressed in pajamas, teeth brushed, and ready to go to their respective beds. I will send my eldest to her room to quietly read a book or play with her dolls while I put her brother to bed. I turn on the fan, monitor, and hug and kiss and cuddle until he wriggles out of my arms. I pray and sing to him and off to bed he goes. Then I go to my daughter’s room who, at 3, is the most challenging to get to bed without a million questions. Not only do we pray and sing songs, she wants stories that I start and she can finish. She likes her clothes, blankets, and nightlight just so. She wants to drink water – which I know isn’t recommended at bedtime – so I usually give her one gulp before laying down. I tell her I’ll check on her later and daddy will too when he gets home. 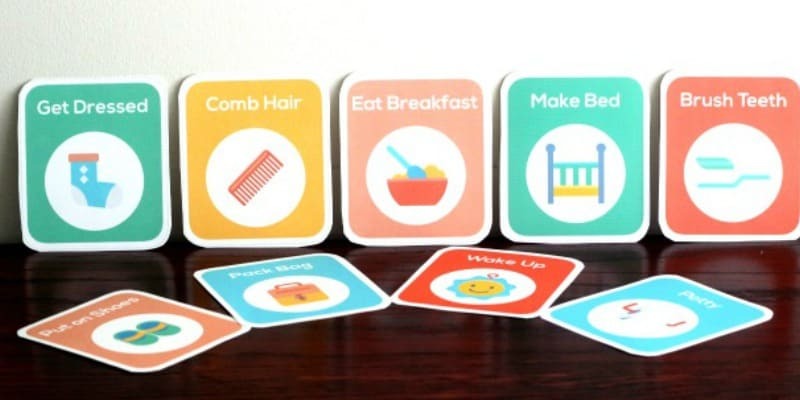 We use these printable routine cards to help the older kids complete bedtime on their own. How I get through the stress of the evening routine alone is to be organized, compartmentalized, and about the business of bedtime. After dinner before bedtime lead up we can play and be a bit rambunctious. Then, when it’s nearing bedtime, I get them to remain in one place or do something quiet as much as I can. I remind them frequently that “it’s almost time for bed” so they come willingly when it’s time. After dinner I get on to the dishes (that I didn’t wash while cooking) immediately so that task isn’t looming over me as I finally get the kids down. Just before bedtime wind down I get the kids to help tidy up. Since all toys go in baskets that they are familiar with, this process doesn’t generally take too long once they’re motivated. I direct one to put up books, another to put away toys in this area, etc. and direct them to return certain items to their place. It is a tremendous weight off my shoulders to know that – after they’re tucked in bed – I honestly don’t have any household related chores to do. Get them to help you tidy up and clean where possible so your recharge time will be maximized. Corral the little ones and direct them to stay in one area so they don’t go tearing up the house while you’re putting one kid down. A small snack goes a long way towards helping them sit still and get calm. Use white noise so that the sounds of those still awake doesn’t prevent those already in bed from settling. 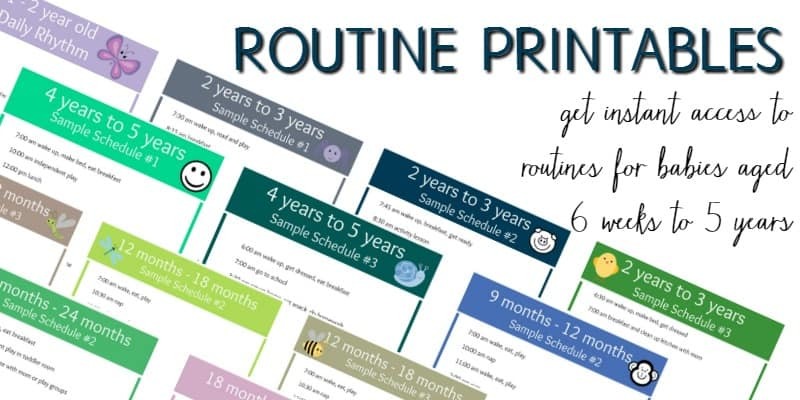 Get printable routine cards for morning, evening, and bedtime routines. You are inspiring.. I struggle to get just one child down for the night on my own. Go you! My little one can’t sit still long enough to let me read her a book. She is almost 2 and it’s been like this from day one! We don’t even bother trying to read any words… now we just point out pictures but she usually just gets up and wanders off which is weird because she really does love books! I too spend many evening flying solo, as my husband is gone a lot for work trips. 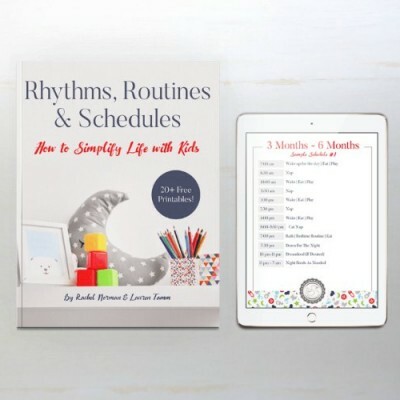 We read books during the day and skip books during our bedtime routine. No good reason. We opt to do a bath instead. I often wonder how that will change if we have more children. Like you, our bedtime routine is about 30 minutes. And bedtime is 730 sharp, sometimes earlier if it was a busy day or naps were off. We also do a “clean up” before bedtime to maximize recharge time. Reading doesn’t have to be only at bed! ! Thanks heaps for this story. My husband has trouble leaving for bible study at 7:15 so I think I’ll try your method for a bit and see if that helps those nights. We have a little girl who is 3, a little boy who is 1 and little 6 month old girl. Thanks for the advice and keep up the awesome job your doing! Great advice! The babies get riled up with even one sibling around, huh? I love your blog and love getting the emails. When do you bathe the children? Do you have a sample schedule that you use day to day? Yes, at least try it a time or two and see how you go. Bath time added to the whole rest of the bedtime routine really does make it seem very long! And bath time in the morning isn’t something that needs to be rushed so, if they’re having fun, they can just stay in it for a while! We have very similar schedules and my LO’s are 3, 2, 1… Yea crazy right!! Well at least everyone looks at me crazy haha. My 3 year old and 2 year old share a room and I am having a hard time with waking each other up. Any tips? My 2 year old goes to bed at 7p then by 7.30/8p my 3yr old goes in the room. My 2yr old wakes up 6.30a (which is really not my ideal wake time) and wakes his brother up. My 3yr old barely takes naps which during the day so I feel like he is not getting enough sleep. Do I make my 2yr old skip his nap? I tried to look up for some ideas at babywise mom website but I couldn’t find anything. All my three boys are Babywise kids. Ha, so crazy we are in the same boat :) One thing I’d suggest is separating them for naps during the day based on their needs. Also, perhaps you could shorten the 2yr olds nap so he sleeps later? I HEAR YOU about the earlier wake time. My 2 yr old is currently waking earlier on days he’s cold so if his room isn’t the perfect temperature, to him, he wakes early. You could try moving your 2yr olds bedtime back a little also? Another suggestion is white noise of some kind. Fairly loud so that your 2yr old has to really make a ruckus to wake the other. And, of course, being very stern with your 2yr old so he gets in trouble if he wakes. I wouldn’t suggest them all at once, ha, but let me know if you see any changes! Also, to be honest, my 1yr old sleeps in a non-bedroom room on the first floor nearer to our master because I didn’t want him to be woken up or wake the other up. Ha! Do the kids sleep through the ministry nights? I’ve often wanted to host things in the evenings, and occasionally do, but not regular things with many people. I’m about to shorten my 3.5 year olds nap too because she’s started to wake 45 minutes earlier each morning which, again, is NOT ideal. I’m wondering if it could also be related to time change which happpens in about 5-6 weeks here? Yes, we haven’t had any problem with that which has been a blessing, it gives me a chance to serve with my husband too which has been great. we have a house full of college students every week and they all love to stay late and talk…. The two younger boys are usually in bed before anything starts, my older one get to hang and mingle for a little bit before I put him to sleep and I usually put their sound machine really loud and turn it down before I go to bed. There has been a couple times I put an extra sound machine in the hallway (our house is two levels and the kids room are upstairs with a door by the stairs – its a really old house and you can hear a lot but the sound machines have done their tricks for us :) Yes totally try it :) I think it gives me a chance to mentor some of the girls and just have some good conversations. 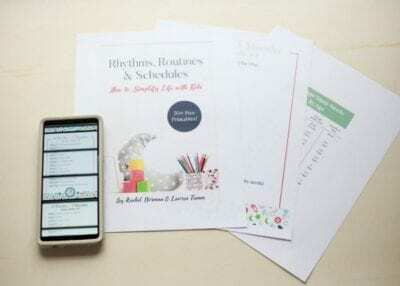 Are you planning to have some quite time once your 3.5yr old stops napping? Mine only naps maybe once a week, he still has to take some rest time..I give him an option to take a book in his room but he doesn’t want to..he just likes to lay down and just talk to himself..should I change his nap room? So far my 2yr old naps in our room and my almost 4yr old naps in his and his brother room.. I think putting her to sleep i the lounge room might be a great idea. If she’s feeling more secure there then I do NOT think you have to force putting her into her room. Perhaps you’ll just have to take it slow and when she tries to come to your room, walk her gently back. And do this oer and over again until she gets it! So important for that calming activity before bed! If they start to get a bit wound up and playing more actively I’ve found it is so much harder to get them down that night. Haha, the other night we had a Frozen movie watching pizza eating on the floor night :) Ah well… they’re only young once! Hi, I read some article about baby health and baby sleep at night. I got some information about importancy of drinking fresh water before going to bed. They always advice that, before sleeping time at night drink 1 glass fresh water. I read all your article and got some more information about baby sleeping time. This is good article. I will visit again for new one. Thanks, Jennifer, good info about the water too! Hi Stacie, I see this was a long time ago now, but I hope you’ve made some progress. I’d make sure and use a lot of white noise because that’ll help keep out the siblings loud noise! Hi! I’m struggling BIG TIME with bed time with 2 young kids, I have a soon to be 3 years old son and 3.5 months old daughter. They both go to sleep VERY LATE, just before 11pm. My toddler takes a very late nap (3-6pm) so he won’t go to bed before 10pm. He still needs his nap, I tried to skip his nap but this didn’t work. I tried to cut his nap too, but he won’t wake up when I wake him. My little baby takes long nap in the morning only. But she won’t take a long nap in the afternoon – she sleeps mainly in my arms while I breastfeed her. When evening comes I am lost WHAT TO DO. Who should go sleep first. They aren’t ready to sleep before 10 and then they are both desperate for mummy putting them to sleep at the same time! (toddler won’t let daddy put him to sleep, it HAS TO be me!). Because I breastfeed, I need to be with the baby. Daddy can’t help. I’m on my own with bed time and I feel lots of pressure on me. I want to satisfy both kids but it’s so hard. When toddler wants to read books, baby starts screaming and daddy brings her to me to breasteed her because nothing else calms her down.Then toddler goes nuts because he gets jealous and wants ONLY mummy! Oh please your advise will be so much appreciated! Will your son take a nap earlier int he day? Ditto, Dany. I have a just turned 4- year old son who I need to be preoccupied while I am putting down his two year old sister for a nap. He constantly interrupts me if I don’t put him in front of the TV and we are trying to keep their TV down to a half hour a day, which is the Daniel Tiger episode before we start nap time. Thanks.